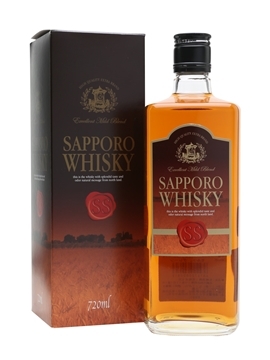 This is made by Saporo Shuisei, but the whisky in this blend is rumored to be from Scotland. Very light in the smell, but with a little burn to the nose. A little vanilla sweetness and oak. Very classic whisky (maybe more classic Scottish than Japanese) and very mild. The taste comes with a great alcohol burn at first. Then some burned caramel and a bit of wood spices. Nothing else happens in the finish, and to be honest, it dies rather fast. A classic everyday dram that does no harm, but lacks in complexity and is nothing you would want if you want to go in depth with your dram. So to be honest, many “everyday drams” out there with much more to offer. I will give this 76/100 (18/20/19/19).